Nicole Martin makes her way down Berry Creek Trail during the Vail Recreation District East West Hopsitality Mountaijn Bike Series Berry Creek Bash on Wednesday, Aug. 15, in Edwards. There is one more race in the series, the Beaver Creek Blast next week. EDWARDS —The Berry Creek Bash starts and finishes at the same location. 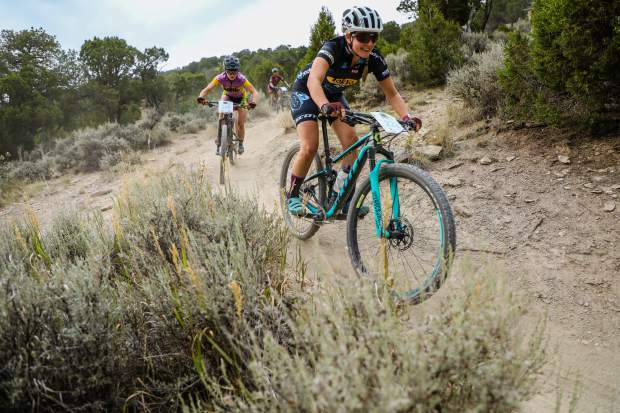 Logically, that would dictate that there was no net elevation gain during Wednesday, Aug. 15’s race, a part of the Vail Recreation District East West Hospitality Mountain Bike Series, in Edwards. “The uphill is three or four times as long as the downhill, and it really hurts,” men’s sport racer John Martin said. “There’s way more uphill, for sure,” Gaja Wilson said. While math and gravity say one thing, when one is actually in the saddle, there is clearly more uphill. Sam Brown is loading up and heading for Fort Lewis College this weekend. He’s spent the summer, at ripe old age of 18, racing in the men’s pro division with the J’s — Jake Wells, Jay Henry and, sometimes, Josiah Middaugh. That said, Brown’s not going to be intimidated by anyone in Durango. Meanwhile, Wilson is gearing up for her senior year of racing with Vail Valley Junior Cycling. The first race is Aug. 25 in Frisco. She has big goals for the fall and so Wednesday was a tuneup. While the leaves aren’t turning, the colors were out on Wednesday. Martin added that his favorite trails are actually at Beaver Creek. The good news for him and the rest of the field is that the series finale on Wednesday, Aug. 22, is the Beaver Creek Blast.